I've seen some renewed interest in wide field of view head mount optics, here on this forum and elsewhere. 20 years ago wide FOV was all the rage and LEEP optics were the way to achieve it. 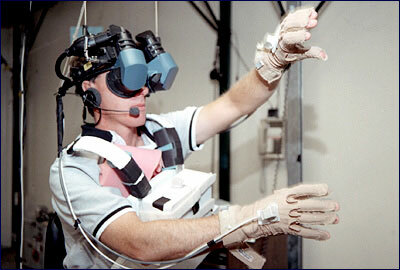 Sometime in the 90's the industry moved away from visual immersion and focused on lightweight and tiny HMDs. Trouble was (is) that these lightweight helmets have really narrow fields of view, like looking through a distant window. Ah man, this is so great! What a pity that i�m so close to finish my hmd-project. Wish i would have known that before! Any specific project of yours where you�re going to use those lenses? Phillip: What I omitted was a better explanation of WHY you need larger lenses to achieve a wide FOV with refractive optics. Stay tuned. I am surprised we haven't already seen HMD's using some of the newer High Def LCD panels. HMD's seem stuck at SVGA resolution for some reason. On a slightly different direction, I think I mentioned the idea of using micro-projectors for a HMD on this forum before. Prices are getting quite affordable. RadioShack has the Gigaware� Micro Projector on store clearance for $90. It is LCoS imagine technology at VGA resolution with 10 lumens. Perhaps using 4 of these, and have two of the images form a stereo pair in the center and the other two forming the far left and right fields. Then the total resolution might be 1920 x 480. Note that I don't know anything about this projector, other than what I just posted. amazing ... Thank you very much! And while looking at V-Rtifacts I saw the russian DIY prism tutorial. I wonder if you know the over/under sibling of it - the KMQ glasses. They much better use the whole screen and allow to view pairs of landscape scenes. I pimped my iPad to iPad-3-D and watched the 3-D trailers of Skrek4 and Avatar - for testing purposes only. It uses the normal video player and H264 encoded 768x1024 (either imported with the camera connection kit or online with safari). 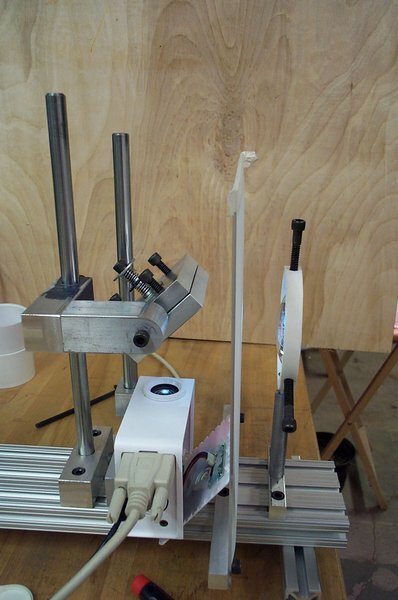 See my website for details on the prism viewer and DIY accessories - but the iPad-3-D tutorial and CAD files are not ready yet. Joe: I think there's a couple of folks out there who are working on putting a high-rez LCD inside an old Liquid Image MRG2.2. From what I've seen, their proposed designs seem quite reasonable. 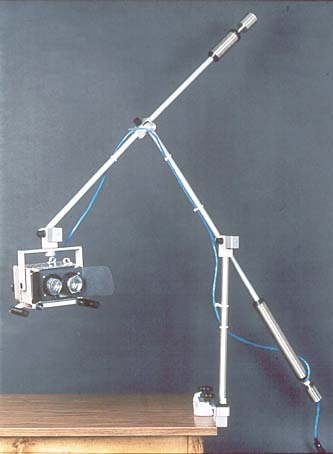 Tell us more about the micro-projector idea. I'm still not visualizing what you've got in mind, but it sounds intriguing. Thomas: I like the over-under approach because of the landscape image format it produces. I have done some single projector 3D theaters this way, turning the projector on its side, formatting the video turned 90 deg with an over-under format, so that the sideways projector shows normal over-under images. 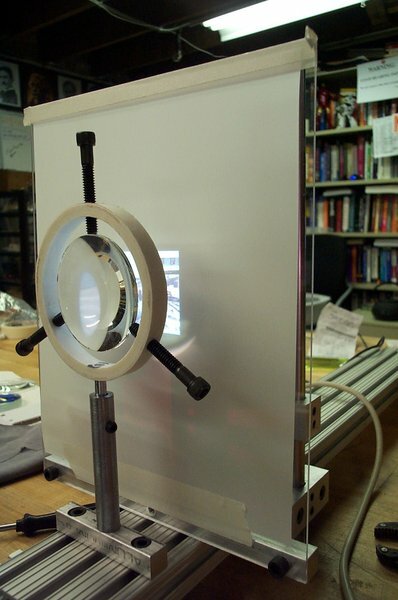 I project through a mirror system that splits the over and the under into two beams of light, then arrange polarizers over each beam. While the resolution is cut in half, it is an easy and lightweight setup. 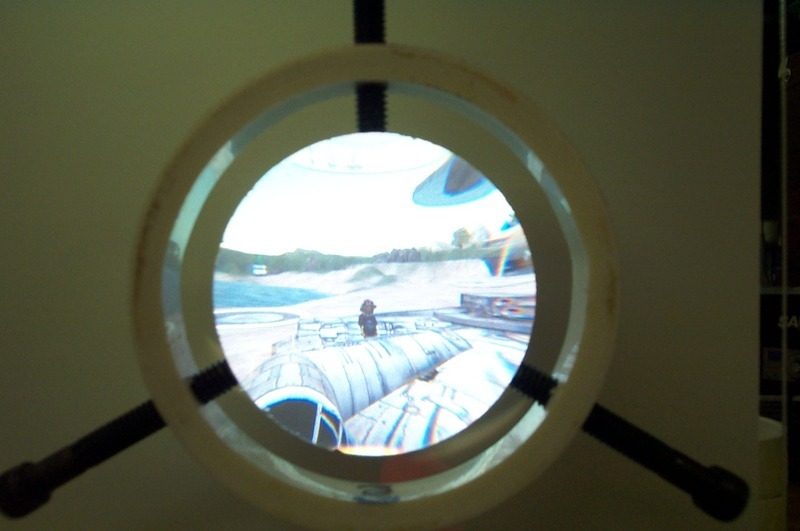 Reflective optics (mirrors) for an HMD has its own set of benefits and problems. In general the design uses the mirror(s) to create a virtual image behind the mirror while also magnifying. My thanks to Maxim for the liquid prism article. I definitely learned something new! I've actually started working on the whole idea of using projectors for a HMD. I managed to get my hands on a picoprojector over at ComputerGeeks for less than $100.00. The resolution isn't too bad at 640x480. Initially I was using cardboard, wood, and tape to hold everything together and it just didn't work. So I ended machining a whole optical bench for this project. You can see some of this over at my website if you're interested. Be aware that this is running on a private server at home, so please be patient. Goto Photo Albums, then Projects. Right now it's under optical bench, but I'm planning on creating a newer VR location. There's also some other VR related pics in the project section. Looks interesting, but wont that HMD be quite heavy when it's finished? Oh and i wasn't too glad about these pico projectors. The one i had was suffering from poor colours, short battery life and it tended to overheat after 20 minutes, simply shutting down. The one on your picture doesnt look too much pocket, won't your HMD become huge with these? Regarding my concept, as I got into it, it didn't pan out so good. The geometries were wrong. However, I did try another concept. This does involve prisms. I had tried to eliminate them in the prior design because I wanted to avoid the chromatic issues. However, I realized that if the projectors use the same prism, then both get the colors smeared the same way. They end up canceling each other. I guess another approach to the chromatic issue if you use LCD displays is to have the computer process the image by shifting the colors the appropriate amount. But, I don't know how easy that would be to implement. Everything in this thread is great, thanks so much for all the information guys! Though I've also pondered on the idea of building the entire works into a boom-like system for inital tests. I'll post more as I have updates. Boom-like mount will also allow you to implement precise mechanical 6DOF tracking. Good luck Michael with your setup!